is navel gazing a liberal term? just wondering, as i've seen in on a left movie site. I've heard of 'navel maneuvers,' which have very little to do with the navy. . .
Maybe it's akin to "meat gazing"? I've generally seen it used as a term used to describe lefties. As in, he's a dope-smoking, long-haired, maggot-infested, navel gazing, FM type. I heard it as "contemplating" one's navel, something hippies did when high. Introspective, solipsistic, self-absorbed, onanist, ego centric -- not mentalities generally cultivated. 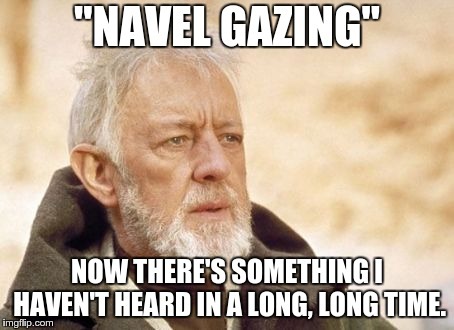 I use the term "navel gazing" regularly these days. I've always taken it to mean someone who is lazy and not too bright, hence he's content to sit and gaze at his own navel, rather than be productive. I guess it’s the 2018 iteration of “contemplating his navel”. At least have the common decency to knock on the bathroom door before entering! You dont want that reputation. I love new words, but there is no way I'll ever remember how that is written nor pronounced. Int that a term for dumber than a sack of rocks? Or is it some type of phrase some liberal women shout when a male looks at them?